Fambly Cat would fit comfortably on Sumday it does go some way to bridge the gap. Its a pretty up and down affair in general, with Little feeling sorry for himself one minute then, as in the glorious semi-instrumental Skateboarding Saves Me Twice, telling us that everything will be just fine. I cant help listening to the last track This Is How It Always Starts without thinking of those terrible compilation moments that Gary Lineker shows us as England inevitably and unjustly exit the World Cup. 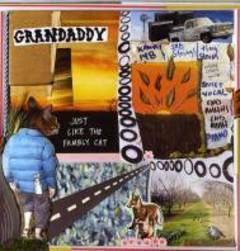 The songs they pick (usually REMs Everybody Hurts) guide us through the highs and lows of a great yet ultimately tragic journey and you could imagine a similar compilation of Grandaddys best moments set to this beautiful and soaring finale marking the end to a truly wonderful journey. And this album as a whole could be those highlights. On Elevate Myself Little states  Id rather make an honest sound, watch it fly around and be on my way. And thats exactly what he has done. His sound will continue to fly and I wish him good luck.